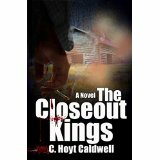 I read C. Hoyt Caldwell’s previous book and liked it. I liked it enough that I was pretty excited when I saw he was preparing to launch The Closeout Kings onto the world. I am very glad he was on my watch list, because this book shows us that Caldwell is honing his writing chops and I anticipate some great books coming from him in the future. What made this book better than his previous offering is his ability to show you the driving motivations behind each character. He makes each character come to life with background stories and motivations. Each action that is made by the characters is believable and the characters jump off the page. The bad guys are shown to have traces of redemption and you ache alongside them as you are pulled into their world and understand what makes them kick. In the past I have read authors as they went from good to great and I really feel Caldwell is an author on the rise. He packs humor, suspense, and surprises into a novel that is a blast from beginning to end. I kept picturing Larry the Cable Guy as one of his main characters and I think this book should be optioned for a film. Very well done! An author I really enjoy reading who seems to fly under the radar is Sam Millar. His latest offering that makes my best books of the year is not a part of the Karl Kane series (a must-read series), but a stand alone novel that floored me. The synopsis on the back of Millar’s book doesn’t even come close to doing this book justice. Nor do the comparisons afforded the book by other authors who compare it to other great books such as Stand by Me, Mystic River, and Sleepers. This book stands on its own and, in my opinion, stand above those great books. On the surface, the book follows Tom, a young boy growing up in Black’s Creek and his friends as they deal with the aftermath brought on by the suicide of their peer. Their peer commits suicide in front of them and it is widely speculated in town that it was brought on after their peer had been molested by the town’s outcast. The boys share in the town’s emotional rollercoaster of emotions ranging from horror of the manner in which the death happens, to sorrow for what their peer went through to outrage that, while everyone knows the reason for his suicide, the law appears powerless to bring justice to the situation. Without giving away key plot points, the reader doesn’t just read about these emotions, but shares in them as Millar does a great job drawing the reader into the novel. At times I felt as if I was a member of Black Creek’s community and I felt the outrage as well. While the law is powerless to bring about justice, we experience it through Tom’s eyes, as it is Tom’s father who is the sheriff and is in charge of finding justice for the young victim and, by extension, the entire town. A man of moral character, his inability to hold the outcast responsible for his actions and the consequences they render, leave him to question his legal decisions throughout the investigation and question himself as a man. Further complicating his guilt is his desire to protect his own son from this outcast, while also being confronted by the father of the victim and listening to this man blame him and hold him personally responsible for his son’s death. Knowing his son is alive and another man’s son is dead, possibly due to him and his actions, lead him spiraling into a depression that threatens to destroy him and his loved ones. Although I was initially disappointed that Millar’s latest book wasn’t part of his Karl Kane series (one of the premier series currently being written), this book made up for that by showing how Millar’s writing just continues to get better and better. This book will not disappoint any reader of his Kane series and is sure to win him more fans. This is one heck of a quality read on many levels. Cry Father by Benjamin Whitmer is one of the best and multilayered books I have read in a while. This is a book that is about men and the relationship they share as fathers and sons. The story features Patterson Wells who has lost his son to a tragedy, but hopes not to lose his son in his heart and memory, so he pens a journal in which he shares his thoughts and feelings with his son so he can explain himself to his son. The book also features the complex relationship between Henry, an old, skeptical man who spends his time listening to a radio show full of conspiracy theories and drinking his life away and Junior, his son who spends his time drinking, drugging and blaming Henry for the troubles and issues that creep into his life on a constant basis. The book further delves into Junior’s ever-failing attempt to break the cycle of parental harm by being a good father to his daughter who Junior loves “so much it makes his bones go soft when he thinks about it”. Whitmer has a great way of getting to the heart of his characters and finds words that bring beauty to the heartache he is painting onto the page. The heartache that Patterson is living comes through the page and leaves you aching for him. Whitmer allows you a glimpse into a life that has led Patterson to feel a repeated feeling of “Not for the first time, he wishes he could be someone other than he is”. This book is sure to be talked about in many literary circles as it is great noir, a great book of loss and a great overall piece of literature. A sure way to summaries the driving theme of the book is to quote Whitmer as he wisely wrote “…think of grieving as a journey, your mother. A mappable line that begins with loss and ends with resolution”. This is a strong, wise book. Joe Clifford has always been an author that had a way of allowing the reader to connect with his characters, see events through their eyes and understand what drove them to do the things they did. But in his new book, he takes this experience to a whole new level. The aspect of Joe Clifford’s new book, Lamentation, I enjoyed the most is the manner in which he explores the innate emotions we experience as we grow older and grow more or less connected to our family circle. This book does an excellent job probing what it means to be family, how people experience and deal with the conflict of feeling responsible for the failings of family members, yet try to pull away and separate ourselves from the heartache that comes from watching a family member spiral into a self-destructive lifestyle. The main character also struggles to come to terms with becoming a full time parent and what that means, both time spent with your child and also the responsibility that brings. He struggles with the burden of living up to the expectations that come with having had parental role models who set the bar high and his uncertainty of being able to achieve that standard, a battle he rages not only for his son, but for the legacy that he hopes to carry on from his own parents. Clifford ‘s writing allows the reader to connect with his character because most people fight the same battles as his characters, albeit perhaps in a different station in their lives. Good writers allow you to understand characters, but great writers allow you to be the character and that is what happens as you read this fine piece of writing. The story is engaging and excellent on many levels. I think this book will bring a whole new range of readers to Clifford’s works and it is well deserved. This novel shows that Clifford is only getting better in his ability to craft a story that is engaging for its plot but also multilayered in its character development.